President Donald J. Trump is using every tool imaginable to decrease the number of immigrants in the United States. Some of his tactics, such as reducing the number of refugees eligible for admission, are within his sole discretion. Others, like “constructing a border wall and ensuring the swift removal of unlawful entrants,” require cooperation with other branches of government, which is not Mr. Trump’s strong suit. We recently suffered a partial federal government shutdown (and may do so again) because authorization for federal spending ran out in December and Congress has not acceded to Mr. Trump’s demand to include spending for a southern border wall in legislation to fund the government. Meanwhile, our diplomatic relations are in turmoil. Nevertheless, international cooperation is needed if Mr. Trump is to achieve his deportation goals. Regardless of the law under which a person is deported, everyone who leaves (or is not permitted to enter) the United States must go somewhere. Deportation is a catchall phrase. It includes the formal removal process guaranteed by statute to those who entered legally but have been convicted of certain crimes or accused of violating their immigration status, as well as the “swift removal of unlawful entrants” through an expedited removal process. Expedited removal currently is applied to migrants who entered without authorization and were apprehended within two weeks of their arrival and within 100 miles from the U.S. border. It also is used to deny entry to “arriving aliens” who dare to apply for admission (and usually asylum) without the required documentation. Removal has long-lasting consequences; every alien who is removed, whether expeditiously or not, is barred from admission to the U.S. for a certain period of time—five years after an expedited removal, 10 years after formal removal, and 20 years after a second removal or conviction for an aggravated felony. With permission, migrants can avoid these time bars by withdrawing their applications, immediately and voluntarily returning to their homelands, or agreeing to voluntary departure. In 2018, the Trump administration enticed parents to accept voluntary departure as a means to be reunited with their separated children. Regardless of the law under which a person is deported, everyone who leaves (or is not permitted to enter) the United States must go somewhere. Mr. Trump cannot unilaterally remove people from the United States because they must be removed to other nations, and those nations must give permission for returning nationals or migrants from other countries to cross their borders. This can be problematic for numerous reasons, including a lack of documentation or a lack of citizenship (statelessness). (The United Nations estimates 10 million people have no citizenship.) Even when citizenship can be established, countries may put restrictions on the return of migrants. In 2008, for example, the United States and Vietnam entered into an agreement for the “orderly and safe” repatriation of Vietnamese citizens who violated U.S. law and met other specified criteria, but Article 2, Section 2 of the agreement exempted Vietnamese citizens who “arrived in the United States before July 12, 1995, the date on which diplomatic relations were re-established between the U.S. Government and the Vietnamese Government.” In 2017 the Trump administration unilaterally determined this exemption did not apply to convicted criminals. Although a few Vietnamese were deported under this policy, the United States was forced to suspend it when Vietnam stopped issuing the required travel documents. Recent reports indicate the Trump administration is now negotiating with the Vietnamese government to deport more Vietnamese citizens who arrived in the United States before the restoration of diplomatic relations. DHS personnel must determine whether an unaccompanied child encountered at a land border or port of entry is capable of making an independent decision [concerning an application for admission] and screen appropriately for signs [of] victimization of a severe form of trafficking, risk of trafficking upon return, and fear of return due to a credible fear of persecution. Despite these agreements and the close cooperation needed with the Mexican government to implement border-crossing changes, the Trump administration has made several abrupt policy changes. Most recently, on December 20, 2018, the secretary of Homeland Security announced that the United States was unilaterally implementing Migration Protection Protocols (M.P.P.) that require asylum applicants to wait in Mexico while their claims are processed. The secretary of Homeland Security reportedly stated this policy would not apply to unaccompanied minors, but the official statement does not mention this exception, and there is confusion regarding the details and legality of the plan. Nations that refuse to accept returnees are put on a list of recalcitrant countries, and the United States retaliates by refusing to permit citizens of those nations to visit here. Anyone who travels from one country to the other and applies for asylum will be returned to the first country (and must be accepted for return) within 90 days unless an exception, such as unaccompanied minor status, applies. But Canadian immigrant advocacy groups question whether the United States is a safe country for refugees and are gathering evidence to file a legal challenge to the agreement. 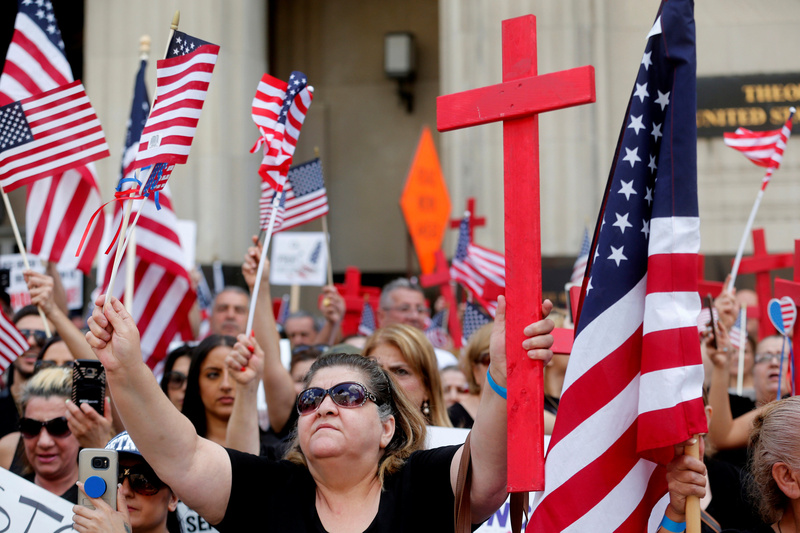 Will the law back up cities and churches that offer sanctuary to the undocumented? The U.S. government uses various diplomatic strategies to encourage nations to accept returning migrants, including the carrot-and-stick approach of granting or withholding foreign aid. It has been reported, for example, that President Trump has offered to pay Mexico to deport migrants from Mexico to Central America. The United States currently pays all costs of deporting aliens from the United States. Migrants who accept voluntary departure typically pay the cost of their own removal, but hospitals may pay for medical repatriation to avoid long-term care for uninsured migrants. Nations that refuse to accept returnees are put on a list of recalcitrant countries, and the United States retaliates by refusing to permit citizens of those nations to visit here. Even when other nations are willing to accept returnees, U.S. law prohibits the return of individuals who face torture in their homelands. Even when other nations are willing to accept returnees, U.S. law prohibits the return of individuals who face torture in their homelands. President Trump recognized this limitation when he excluded those eligible for withholding of removal pursuant to the Convention Against Torture from his presidential proclamation denying asylum rights to migrants who illegally cross the Mexican border. The Supreme Court’s refusal to lift a lower court injunction prohibiting implementation of Mr. Trump’s asylum ban is another lesson in the limitations of executive authority to control the deportation of aliens. An estimated 10 million to 12 million deportable persons (illegal entrants, visa violators, and convicted criminals) live in the United States. In fiscal year 2018, Immigration and Customs Enforcement removed 256,085 of them. As Mr. Trump enters his third year in office, he may be realizing that the rule of law puts limitations on governments as well as immigrants. The United States is not unique in desiring control over who lives within its borders. Irregular migration is a global problem that requires global cooperation. This story has been updated since publication to reflect the (temporary) resolution of the partial government shutdown. Calls to mind that age-old question - WWJD? Who would Jesus deport? He already said, "Render to Caesar the things that are Caesar's ... "
In this abominable era of epidemic lawfare, not limited to the USA, the blithe assertion that law applies to rulers as well as subjects is a naive simplification. President Trump is all too well aware of the misuse of law for years by Democrats and co-conspirators to bring about one-world government by any means necessary. US law is NOT sacred and has been terribly misused; just think how it has allowed the slaughter of the innocents. If the writer is a Christian, she would do well to revisit all of the writings of Paul where she will see - the LAW brings DEATH - over and over; and claiming a special interest in legal issues, remind herself that the USA specifically mandates separation of church and state. You are repeating an ignorant right wing paranoid talking point when you say this is about a one world government. There are international laws for a good reason.If a US citizen in Iraq, accidentally wanders into Iran, we are outraged if the Iranian government imprisons them. We don't want a sovereign country asserting its sovereign right to shoot anyone crossing into their border. The US tried the Nazis after world war 2 for not following moral norms. We established international laws and treaties which we are a party to and which we ourselves ,the US, implemented for how governments can behave towards people entering their borders; as migrants ,refugees or asylum seekers. The USA does not specifically mandate separation of church and state. The First Amendment prohibits government establishment of religion and certain restrictions on the free exercise of religion. The US Supreme Court has interpreted this amendment to permit the government to work with religious groups to provide social services, such as refugee resettlement and emergency food distribution, and to provide tuition vouchers and free textbooks and bus service to students who attend religious schools. The US Supreme Court also upheld the Religious Freedom Restoration Act, which prohibits the federal government from substantially burdening a person's religious practice without demonstrating that the challenged law is narrowly tailored to achieve a compelling government interest. This law was relied on by the Little Sisters of the Poor, and others, who successfully challenged the Affordable Care Act's contraception mandate. Several of the original 13 states had constitutions that established a state religion so it was not against the constitution. A national religion is against the First Amendment not one by an individual state. The concept of church and state separation came about when an anti-Catholic Supreme Court judge established the concept of separation of church and state to prevent help for Catholic schools. I appreciate Prof, Boegel’s explainers. Those with credible fear of persecution are not the issue. Those who dishonestly claim persecution, when their primary motivation is economic opportunity are destroying credibility in the system.